What if I told you that you could enjoy these amazing chocolate bites completely guilt free? Not only that, they are good for you (in moderation, of course)! Making your own chocolate could, however, almost be called science. 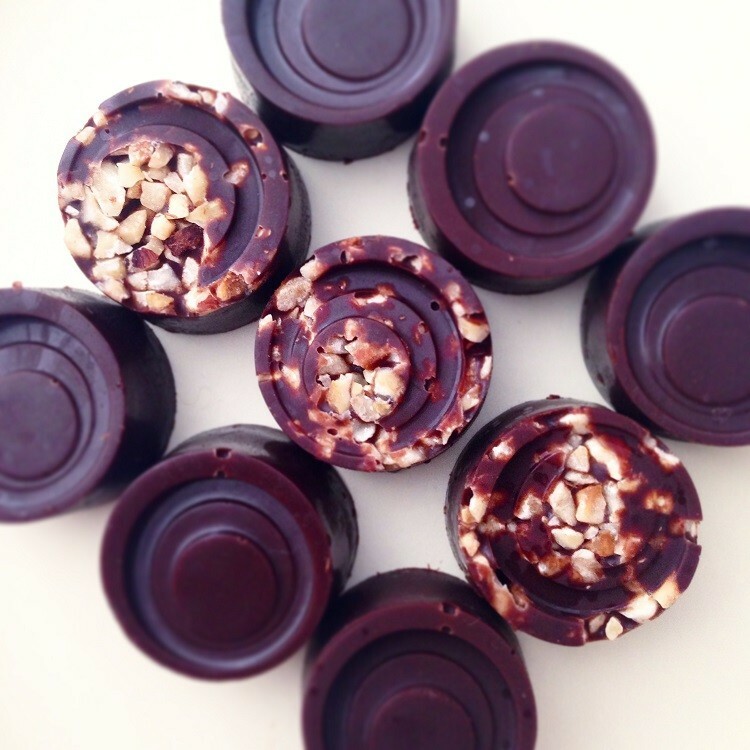 If you wish to achieve the perfect texture of a chocolate bite and want it to melt in your mouth like it should, the process you will need to go through is the so called “chocolate tempering”. It requires heating and cooling your ingredients to three different temperatures. But trust me, it’s worth it! The recipe I used is by Barabrella – Green Chef. 1. Prepare two dishes. Pour boiling water in one and place the second one on top. 2. Add 40 g cacao butter and 30 g raw cacao powder into the top bowl and stir until cacao butter melts. Use a hend-held thermometer and heat the mixture to 46 degrees Celsius. Once heated, add the remaining cacao butter and stir at 46 degrees Celsius until all the ingredients have melted and the mixture is completely smooth. 3. Remove from heat and add the remaining ingredients. Stir the mixture continuously and let the temperature drop to 28,8 degrees Celsius. 4. Place both bowls back on the heat and heat the mixture to 31 degrees Celsius. Your chocolate is now properly tempered. 5. Pour the mixture in silicone chocolate or praline moulds (or mini muffin liners) and place in the fridge for 3 hours to cool. 6. 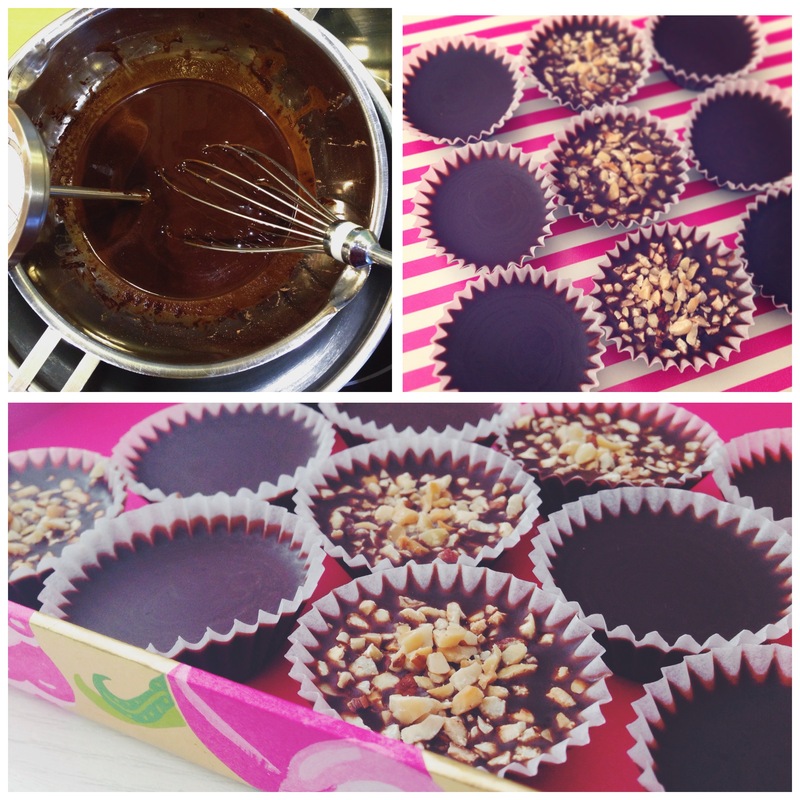 You can add your choice of nuts or superfoods in the moulds prior to pouring in the mixture or sprinkle some on top.